Specifies the maximum delay tolerated in ms. Defines the exact, minimum and maximum sizes of the server response body. HTTP header lengths are disregarded. The default length is the length of the server response content at the time of recording. Greater than denotes greater than or equal to; Lower than denotes smaller than or equal to. Checks whether or not the server response contains a certain content. The server response is considered valid if all the content conditions are satisfied. 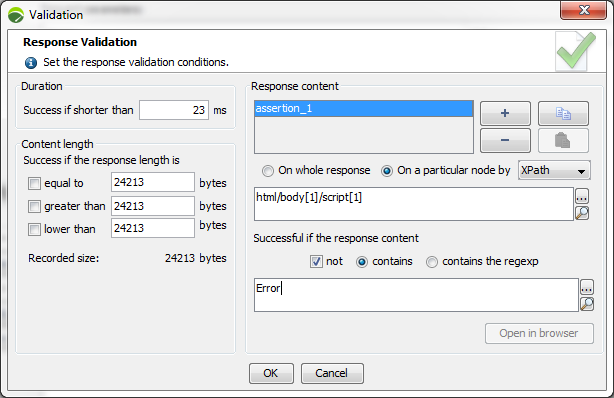 On whole response: The validation check will be carried out on the HTTP responses headers and body. This is the default option. On a particular node: The validation check will be carried out on one of the nodes in the response body. This node is defined using XPath or JSONPath expressions. This option is available for XML and JSON responses, which includes HTML, XHTML, SOAP, GWT, Adobe Flex/AMF, Oracle Forms, Java Serialization, RTMP, Siebel responses, etc. A click on the facing list box allows selecting the required format. contains: Checks if the body of the server response contains the specified text (example: <span class="welcome">Welcome</span>). contains regular expression: Checks if the body of the server response contains the specified regular expression (example: <span class="welcome">Welcome \w+ \w+ </span>). Note that the content assertion may contain variables.